No DOCTOR WHO Series 10 until 2017, and Moffat's successor chosen! Oh, wow! There's big news for fans of Doctor Who. Good or bad? That's down to personal opinion, but I think we can safely say the lack of new episodes this year is on the downside. It’s been announced that 2016 will only feature a Christmas Special, so Series 10 of Doctor Who won't arrive until spring next year. Why? It's to allow Steven Moffat time to create a perfect farewell run of 12 episodes; because he's also confirmed it'll be his final year running the show! But who will replace Moffat? 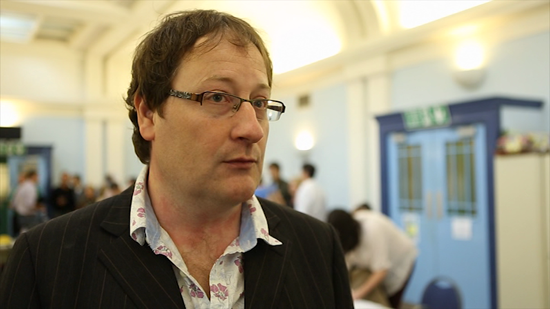 That'll be Chris Chibnall, a semi-regular writer for Doctor Who since it returned in 2005, who was also showrunner of Torchwood Series 2. More recently, he created the short-lived Starz drama Camelot in the U.S, adapted Law & Order for the UK, and is now best known for being the mastermind behind ITV's Broadchurch. "Feels odd to be talking about leaving when I’m just starting work on the scripts for season 10, but the fact is my timey-wimey is running out. While Chris is doing his last run of Broadchurch, I’ll be finishing up on the best job in the universe and keeping the TARDIS warm for him. It took a lot of gin and tonic to talk him into this, but I am beyond delighted that one of the true stars of British Television drama will be taking the Time Lord even further into the future. At the start of season 11, Chris Chibnall will become the new showrunner of Doctor Who. And I will be thrown in a skip." Chibnall will be in creative control of Doctor Who Series 11, launching in 2018. What do you make of this news? Is Chibnall the best man for the job? I liked the first series of his murder-mystery drama Broadchurch, but the second was very weak and I'm now dreading the third. His existing contributions to the Whoniverse are of questionable quality, too. He wrote the terrible "42" and "Dinosaurs on a Spaceship", after all! But he's clearly a very capable executive-producer, with big shows like Law & Order UK and Broadchurch under his belt, plus well-received single dramas like United and The Great Train Robbery.